The District of Columbia Water and Sewer Authority recently unveiled a $470 million waste-to-energy system that converts solid sludge (we generally call that human poop) to clean energy. They will be using a Norwegian thermal hydrolysis system, becoming the first utility in North America to use this system. Also, according to authorities, this is the largest one in the world. Norwegian company Cambi AS built the system, which relies on high heat and pressure to pressure cook the solids at the end of the wastewater treatment process. They treat the biosolids (again, read: poop) to make them more degradable and then send them to four concrete 80-foot high anaerobic digesters which in turn generate methane. The methane is captured and fed into huge turbines which generate clean energy. “The project, which broke ground in 2011, was only viable through the use of innovative technology never before used in North America. 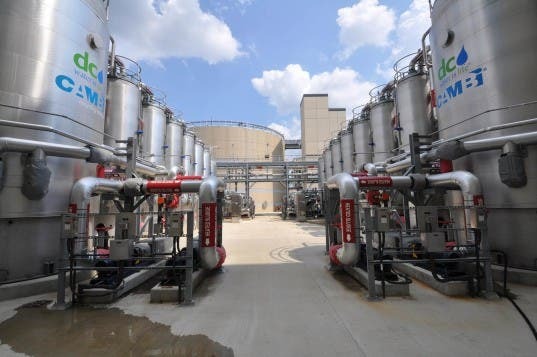 DC Water brought the CAMBI® thermal hydrolysis process to the continent; in addition, Blue Plains is now the largest thermal hydrolysis installation in the world. Thermal hydrolysis uses high heat and pressure to “pressure cook” the solids left over at the end of the wastewater treatment process. This weakens the solids cell walls and the structure between cells to make the energy easily accessible to the organisms in the next stage of the process–anaerobic digestion. The methane these organisms produce is captured and fed to three large turbines to produce electricity. Steam is also captured and directed back into the process,” their website reads. Since this project was launched in September, it’s been generating a net 10 megawatts of electricity from the waste treatment process. The wastewater treatment plant has a capacity of 370 million gallons per day, and is the largest consumer of electricity in the nation’s capital. The entire system together will save about $10 million annually and cut carbon emissions by a third.